Calendars where first introduced to man, as far back as time can go in the 1st to 9th century BC. Julius Caesar also introduced the Roman calendar also known as “Julian calendar”. This calendar is closer to the solar year than all the other calendars before it. But in recent times, we have adopted the Gregorian calendar, most countries of the world use this calendar system. It was introduced in October 1582 by Pope Gregory XIII, which is the main reason it is named after him. Today, calendars are used worldwide to keep track of time and events, with technological advancements, it is now in our pockets and practically everywhere online. There are so many online calendars nowadays to help us keep track of events at work, home or personal life events. PHP calendars, events, and booking scripts have changed the way businesses handle customer appointments, delivery, reservations and so much more online. Adding PHP calendar with events to your website might just be the best thing for any site owner or business. As a business or individual who provides services to customers, it is paramount that you have a flexible and easy to use booking system on your website. This would allow your site visitors to see your availability for them to make appointments as potential customers with a date that suits their schedule and yours. As an organization, a business, brand or an individual; having the PHP calendar with events is a great way to reduce phone-calls to your front desk for appointments, bookings and so on. This will give your staffers time to be productive and creative in other key areas that will grow and improve your business. This online PHP calendar with events helps any size of business or organization by keeping team members informed through event and task sharing. This is not limited to businesses, companies or organizations alone, performers, writers, bloggers, artists and many more can also use these PHP calendars on their websites to keep fans and followers up-to-date about concerts, events, performances, public appearances and much more. 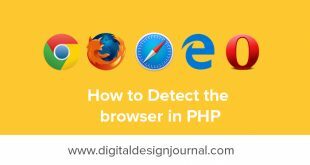 If you are on the lookout for the best PHP calendar with events to implement on your website or that website project to help you with tasks such as schedules and bookings for appointments, you might want to add an online calendar like Google Calendar on your site to enable customers book or schedule an appointment with you. This article is focused on giving you a concrete list of some of the best PHP calendars with events, some free and some you have to pay a small fee to get the script to implement on your website to give it that user-friendliness. TeamCal Pro is a PHP script that supports group projects, business appointments, real-estate managers and many more businesses to plan their availability or absence. TeamCal Professional is a web-based application that uses PHP and MySQL database for information storage. The general idea behind this PHP script is to show the presence/absence of project team-members daily. As a day-based management system, you get to see which team member is in or out and why they are not around. Some of its key features include user self-registration, avatars, absence counts, user teams, user authentication, allowances, absence icons, and more. This is a free open source application for use in all non-profit environment at no cost, but if you intend to use it for commercial purposes to manage employee absence; then you have to make a donation of 50.00 EUR. This is an innovative PHP script built for home and some business use to mark event dates on the online calendar. 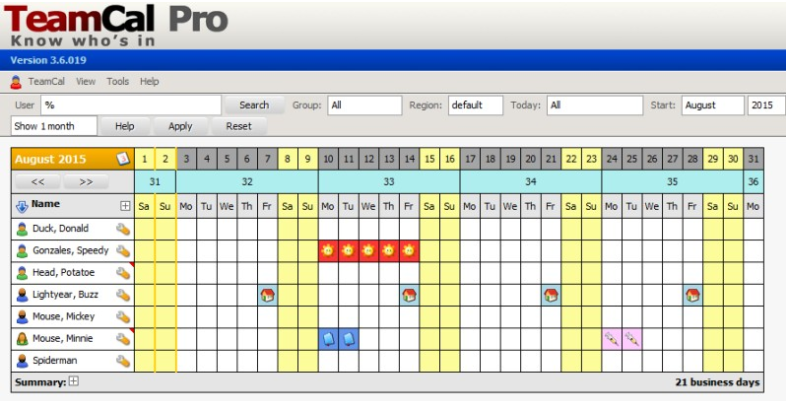 It is also not hard to set up and installs for management of calendar events from any device within your workplace. LuxCal is user-friendly, responsive and supports year, month, week, and day event viewing modes and even forthcoming events with changes. Regardless of which viewing mode you set it, it displays all the events and every detail as you hover your mouse on it. Some key features include RSS-feeds, secret protection, 12-hour am/pm and 24-hour time format, coloured event classes, multi-day events, user self-registration, versatile date format, advanced continual events, week begin on Sunday or weekday, email notifications due dates and calendar changes, non-public events, import/export of iCal files, multi-language support, access rights configurable per user, import of CSV files, and more. It runs on a PHP/MySQL server. TeamCal Neo is the updated version of TeamCal Pro. It is a completely re-written responsive and user-friendly web application that uses Bootstrap, jQuery, Font Awesome and PDO. This tool uses PHP and a MySQL database, and you get to enjoy all the TeamCal Pro features in an all-new modernized design. You can get this script free at no cost if you want to use it for personal use if, for commercial use, you have to pay €80 annually for the license. This is a small but great web application for people who want to keep track of their expenses and taking control of the money flowing in and out of their pockets. Ajax expense manager has a PHP calendar that keeps track of daily, weekly and monthly expenses as well as by categories. Because of its jQuery plugin and PHP class, it is easy to customize and easier to add on any website based on user preference. Data can also be exported as CVS for sharing or other purposes. Check the links below for the demo and download pages. 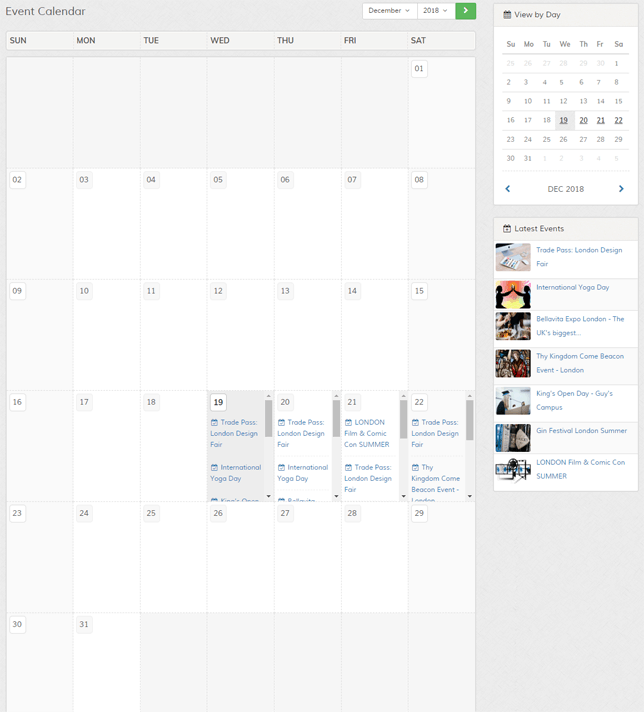 This is another PHP calendar with events that can be added to any website. It is an Ajax Full Featured Calendar with jQuery plugin and PHP category, this means it is easy to customize and also designed to assist you in keeping things organized. Its PHP category and jQuery plugin enable it to retrieve events from the calendar, add, delete, view, edit, export, and update calendar events on drag and resize. It is easy to use and implement, it also comes with other features like Google map, multiple language support and many more. It costs $18 for the regular license and $90 for an extended license. Check the links below for both demo and also to download this calendar. This is a booking app on CodeCanyon with amazing features which enables site owners on visitors book appointments, events, and many more. This online app can be implemented on any website that would like to make setting appointments and visits easy for customers, it has Google Calendar synchronization which adds all bookings to the calendar for an easy reminder. The live chat and detailed documentation make it absolutely stress-free during implementation without any coding knowledge. Follow the links below for more information on how to download and a demo. The booking system is another powerful tool that can be added to any business site for a detailed list of events with calendar dates to show. It could be appointments, bookings, reservations and so on. This PHP calendar with events makes it easy for potential customers to set up appointments in minutes on your site. It costs about $39 for the regular license with extended support for up to 12 months totaling $51.75. Check it out using the links below. 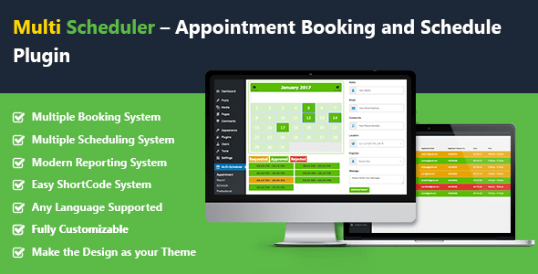 Multi-Scheduler is a multi-booking plugin with modern functionality and a great number of features to ease client or customer appointment bookings. It is user-friendly, convenient and flexible for site owners and clients. It has features such as Google Calendar System, Instant Email Notifications, Easy ShortCode System, Fully Customizable admin panel, supports any language and many more. It supports client scheduling, event booking, resource scheduling, doctor appointment scheduling, general appointment scheduling, and more. This means it can be used on any site be it, an organization, corporation or personal business. 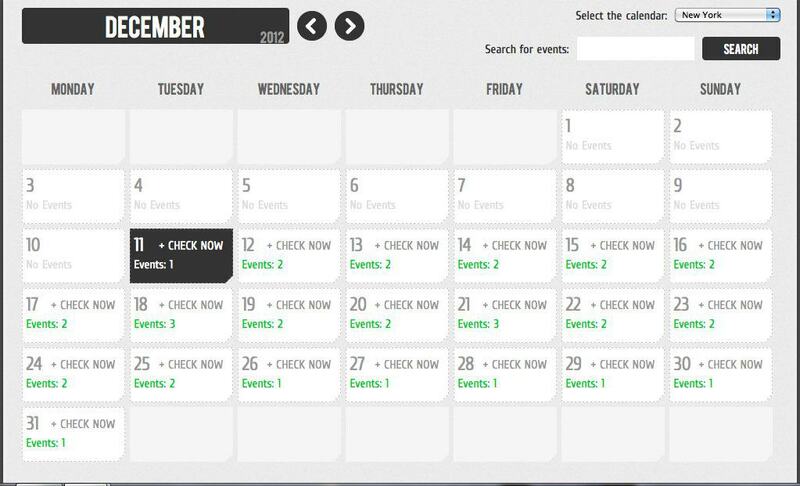 Get the Multi-Scheduler PHP calendar with events booking plugin using the link below. This is one of the best PHP calendars with events out there, it is a user-friendly multi-user scheduler/calendar script with so many great features. 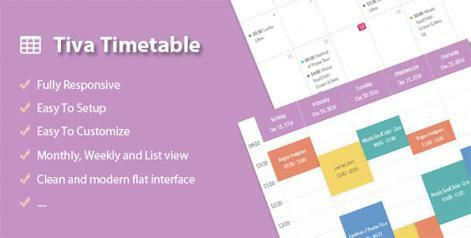 Some of its features include shared calendar option, timeline option, event reminder function, it has a note icon to make notes for remembrance, mini calendar visibility, today’s event, upcoming events, language translation option, Bootstrap style customization feature, and many more. It is easy to customize and integrate on any website or web application. Caledonian PHP calendar with events costs around $17 for its regular license and $70 for the extended plan which adds more features. Check it out using the link below. Another complete solution to all those who are looking for the perfect PHP calendar with events script to settle calendar needs on their sites is the PHP Events Calendar Control. 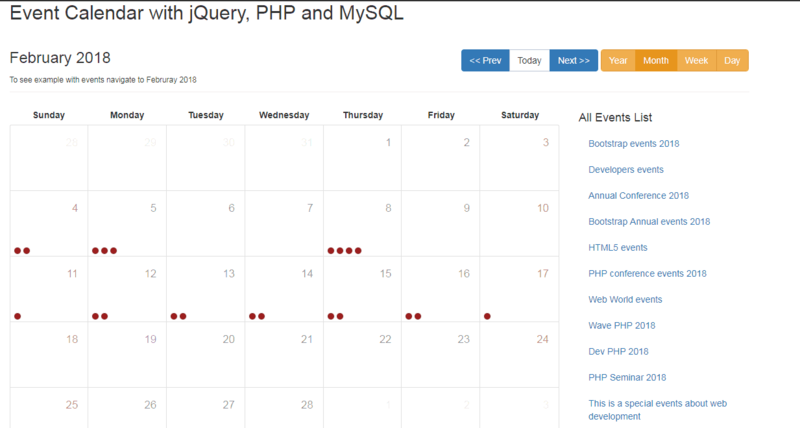 This PHP calendar with events is an element that comes with a variety of features like event schedules details, publishing and viewing calendar events, a user-friendly layout designed to fit your calendar needs, and a statistical data with overall information of events on a daily, weekly, monthly and annual or list view basis. 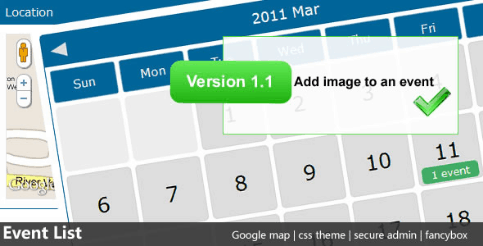 It is simple and easy to install the calendar script on any website. You can export calendar events as CSV, XML or iCAL file formats for sharing or other purposes and also print out events using the print page functionality. PHP Events Calendar Control will cost you $23 for the regular license and 6 months support while the extended license with 12-months support costs $125. Check it out using the link below. This PHP calendar event script is one that allows users to create, manage and display events on their websites. 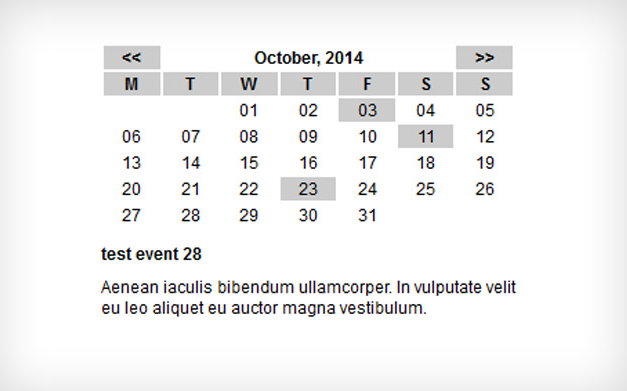 PHP LBEvents lets you create numerous calendars with different settings and events for each day displayed. Some of its features include viewing events by location and organizer, Multiple language support, event repetition type (None, Daily, Weekly, Monthly), widget to display events (Tomorrow, Today Upcoming, Ongoing, Today Passed, Yesterday And Date Range) and many more. To get a feel of this PHP calendar script, you get to pay $16 for the regular license, and $80 for the extended license. 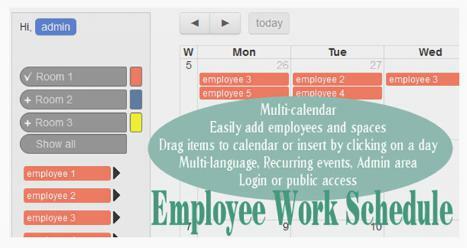 This is a multi-calendar used for scheduling employees, events, spaces and more in several calendars. The dashboard has so many settings which can be customized to look the way you want it to such as the date/time formats, views, am/pm, and so on. Other key features include permission for privileged persons who can add, edit, and delete events on the calendars, calendar status if it is private, public, private for groups, if it users have to log in, if you want to allow spaces such as shops, departments, and more or employees in separate calendar block and much more. Reg4Class is perfectly designed for those tutors who are not in the public teaching sector. This PHP script helps such lecturers and tutors to effectively manage the students, locations, classes, finances, and schedules all online. You can set the category according to how you intend to bill for your services rendered such as hourly rates, you can also schedule lessons, add students, keep track of students who have made payments with your balance and record student group actions and so on. This PHP tool is specifically designed to solve booking challenges for like booking and scheduling events. 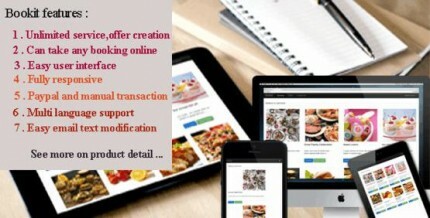 Some of the features included are creation of many services, unlimited offers/events under these services, availability (day/date, time slots, maximum/minimum space, and price per space) per service or offer, clients can make reservations with ease, Paypal integration for fast payment by clients, supports offline payment, responsive design, and layout, and can be integrated with your website or Facebook page. Check out the demo and download this PHP calendar with events using the links below. Ajax Multipurpose Responsive PHP Calendar is another tool for event management, planning, reminder, to-do-list and more. This PHP script saves time and money for clients and site owners, it is easy to integrate on any website type or CMS (Content Management System) like WordPress, Blogger, Joomla, Drupal and more. Programmers use this tool for their personal projects as well, this calendar displays information straight from the database. Ajax Multipurpose Responsive PHP Calendar does not require any page reload in the process of navigating the dates. Check this PHP calendar with events script using the link below. 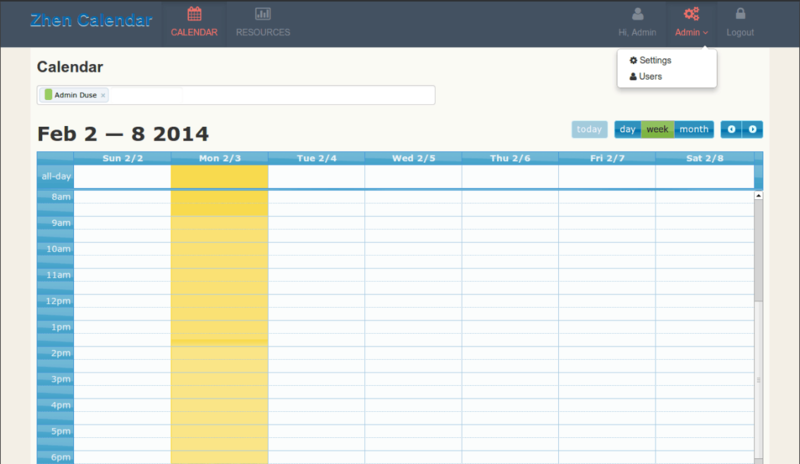 Another calendar that is used to add appointments to show when busy or not, is the Zhen PHP Calendar. It is a system that allows users to schedule or book for a service or person to avoid confusion during booking for meetings by clients. You can share the calendar data with your social media groups and also send invitations to others. Zhen PHP Calendar is highly customizable, supports multiple users, private sharing, smart scheduling and more. Check it out below using the link. 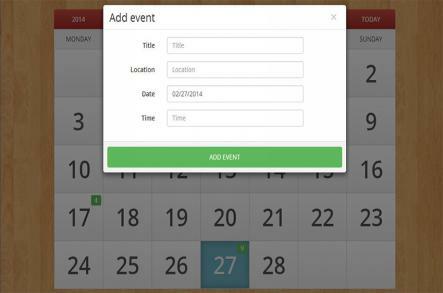 Events PHP Calendar is a script that enables an administrator to add and create 1, 2 or more powerful calendars for different events category or locations, with the ability to add unlimited events on the calendar. Events PHP calendar also lets you add the start and end date and time for events, admission (free or paid), spaces available, pictures, map locations, videos and more. Other features included creating events per city, with city names, for rooms with conferences, for tours and vacations for travel agencies and more. To integrate this PHP script into your website and enjoy its features, you will pay $16 for the regular license with 6 months of support and $20 which includes 12 months of support. Check it out using the link below. Looking for an ideal tool PHP script to add to your cleaning business website for bookings and services? Then, Cleanto PHP Calendar is the word. 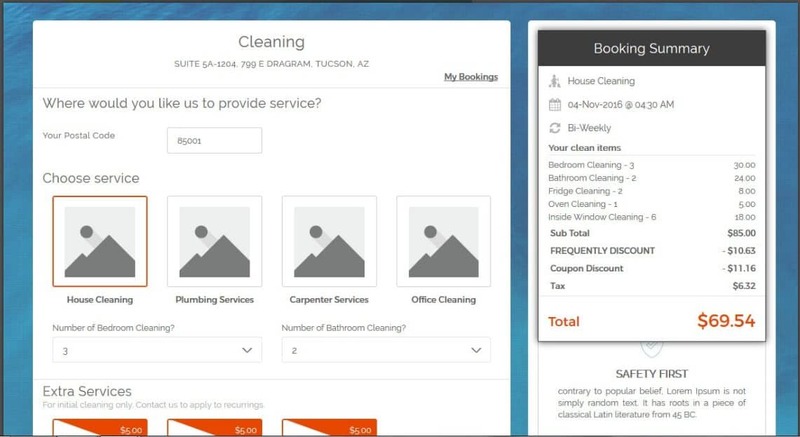 If you are a company or business that wish to give your customers the best form of online booking, Cleanto booking system is powerful enough to ensure flexibility for users. 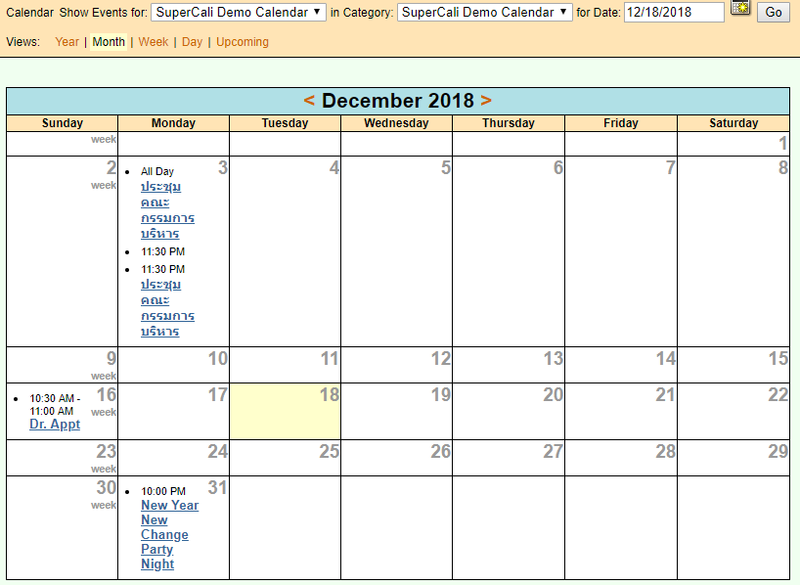 This PHP calendar with events script fits into any cleaning service business setting such as domestic, laundry, carpet cleaning, maid services, cleaning businesses, janitorial booking, handyman services, on-demand cleaning, plumber booking services, Pest Control booking, maintenance & repair services and more. 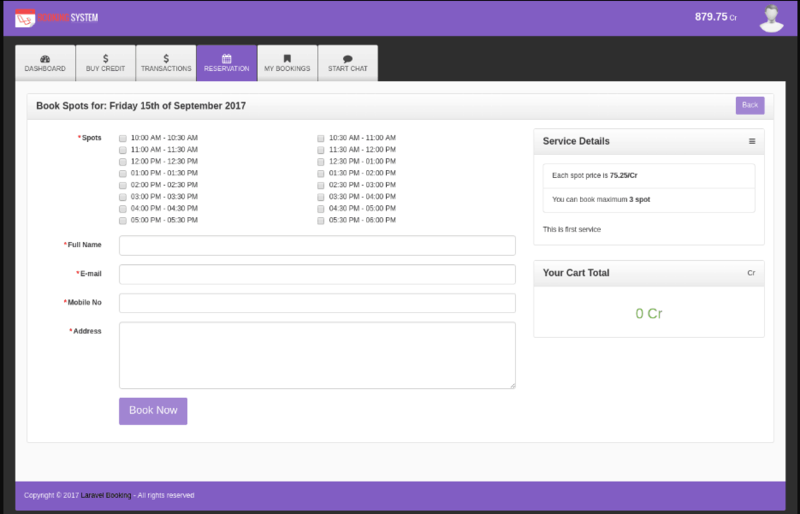 This booking tool has many features like dynamic pricing which lets you create your own methods of calculating prices. Single page checkout, csv reports export, easy schedule setup, pdf invoice, partial deposit, coupon discount, guest user checkout, and many more. You can collect payments through Paypal express checkout, Stripe, Authorize.net, and more payment methods. Other features include email reminders, auto-confirm a booking and so on. It costs around $79 for the regular license with 12 months support or upgrades with extra $27.75 to get 12 months support. This PHP script is a theme that has an Admin panel which you can use for display and also managing events on your site. 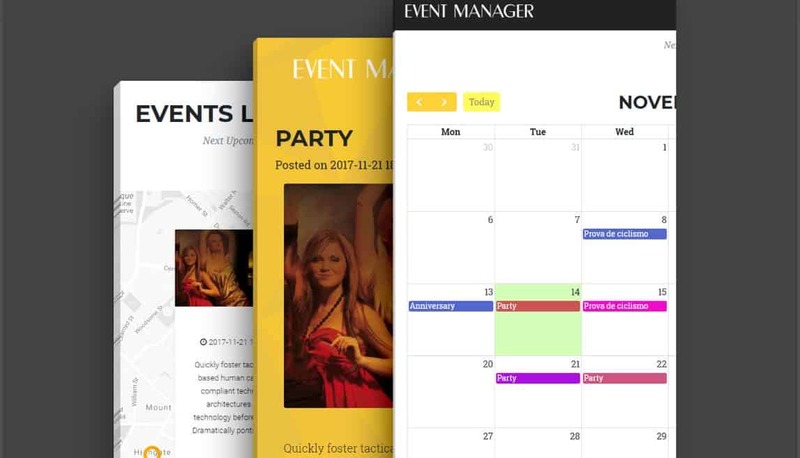 Event manager gives you the possibility of running 3 different types of events on display. Some of its key features include creating events with map locations using Google Maps, use of organizer as calendar, list display, modern layout, and many more. 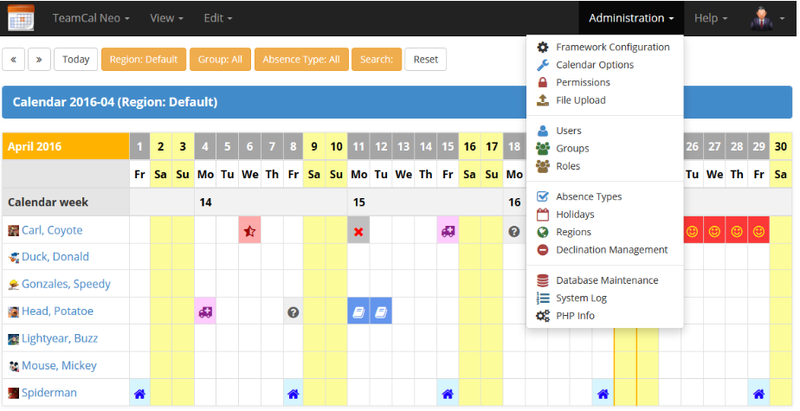 The admin panel makes it easy to use with multi-language support, it is built using a combination of PHP/MySQL, jQuery FullCalendar with a Bootstrap Grid Layout. It is a responsive plugin that adapts to all devices either desktops or mobile. 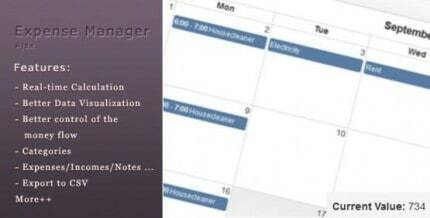 This PHP calendar events manager plugin is not free and it costs $24 for the regular license with 6 months support which can be increased with a $7.13 for 12 months extension. Are you into the hospitality business like hotels, real estate and more? This PHP script will help you run that business with less stress, in a timely and organized manner. PMS – Front Desk Management System is the key factor in boosting your hotel business as it will handle tasks for you with convenience. 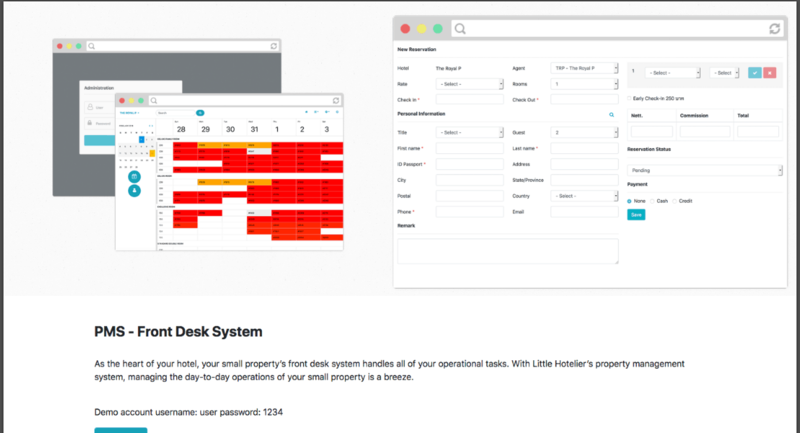 This tool makes running daily operations for your properties simple in a highly effective way. You can set the calendar in a particular position of your site to keep tabs on everything in your business, add reservations easily, close/create new reservations with quick updates (a bulk upload feature). It supports multiple rates for travel agent contracts, multiple property management, daily check-in, and check-out report and also auto room availability selection feature just to name a few. You can get all these features for $51 with 6 months support and a 12 months support extension for $17.25. Vacation Rentals Booking PHP Calendar is another tool that makes property rental or other booking activities online a piece of cake. This PHP script gives property owners or agencies that manage properties, the privilege of creating and managing calendars to show rental availability vacation, apartments, villas, homestays, inns, resorts and more for rent. Its PHP calendar with events is highly customizable, it has also email notification feature direct to the property owner or the administrator. It is highly responsive, works on any device or browsers, exports your calendar to iCal supported by Google calendars and can also be imported into calendar apps & email. It cost about $33 for the regular license with 6 months support which can be extended to 12 months for an additional fee of $10.50. Check it out using the link below. Tiva timetable is also one good choice when it comes to planning appointments, bookings and scheduling on your website or business online. It is an easy PHP calendar with events that takes nothing to set up, fully responsive and customizable. Its simple and clean design gives it that modern look and feel. 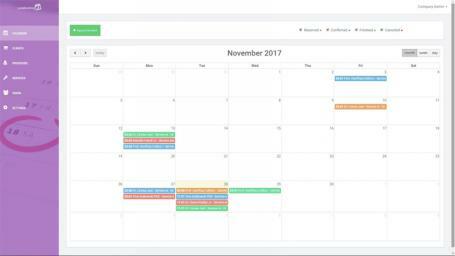 Some of its many features include 3 layout options (monthly, weekly, or list view), and an admin panel to control your calendar. It will cost you only $19 for the regular license with 6 months support which can be extended with just $5.25. Use the link below to see the demo and also to get this PHP script. 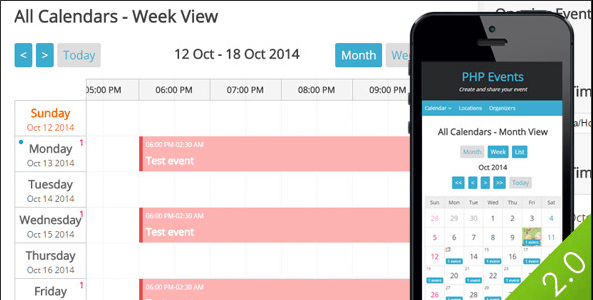 Designed using PHP/MySQL and built with jQuery FullCalendar and integrated into Bootstrap Grid Layout for ease of use. It is fully responsive and fits on any device screen size, and also lets users plan and organize events with just a few clicks. You can integrate it on your website, app and even web server to enjoy its full functionality. It is not free but not expensive at $19 (6 months support), you can extend support for $5.25 to enjoy 12 months support from EZCode. Get this PHP Calendar with events using the link below. 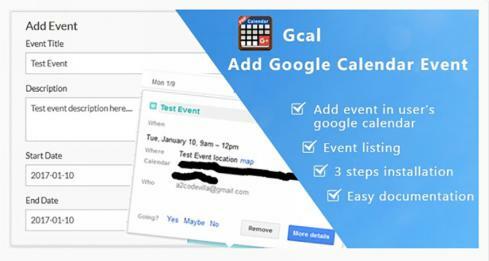 Gcal lets users add events directly to their Google Calendar. This PHP script is simple and easy to install onto any website, application and so on. It is a straightforward booking system that is designed specifically with Google Calendar users in mind. It is easy to add events, just by filling a form and submitting it, adds events to the Google Calendar of the email submitted. Some of the top features include event listing, event updating, viewing event details in a pop-up, easy documentation and 3 step installation. Get these features for just $15 and extend support for $3.75 to get 12 months. Follow the link below for more details. LaraBooking is built using Laravel 5.5 alongside VueJS, the is also an amazing booking app for online activities. It has a great interface that is clean, responsive and gives users a smooth process of booking appointments on the PHP calendar directly. This PHP calendar with events displays available time and also alerts users through email notifications about available appointments and more. Other features also include the ability of providers to view and edit appointments which secretaries can also do Admins have the full privilege to add new providers, view and edit all appointments, services, and more. Get this PHP script and enjoy its features for just $50. This PHP script gives you the possibility of scheduling events for your company, business, and so on. 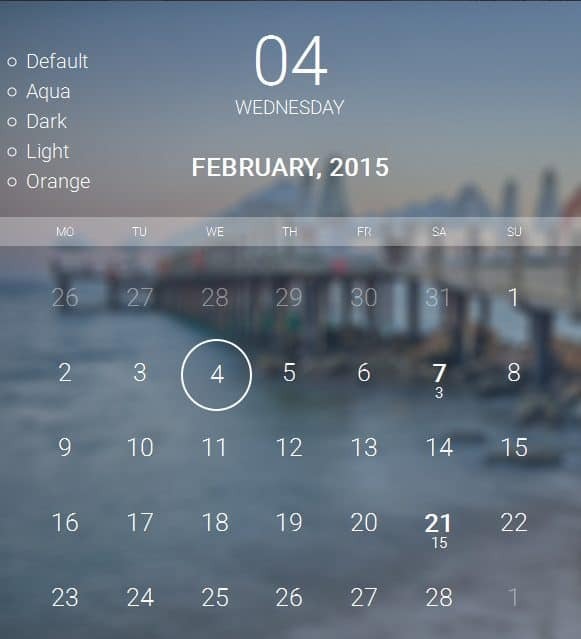 This beautifully designed calendar lets users add an unlimited number of events in seconds. 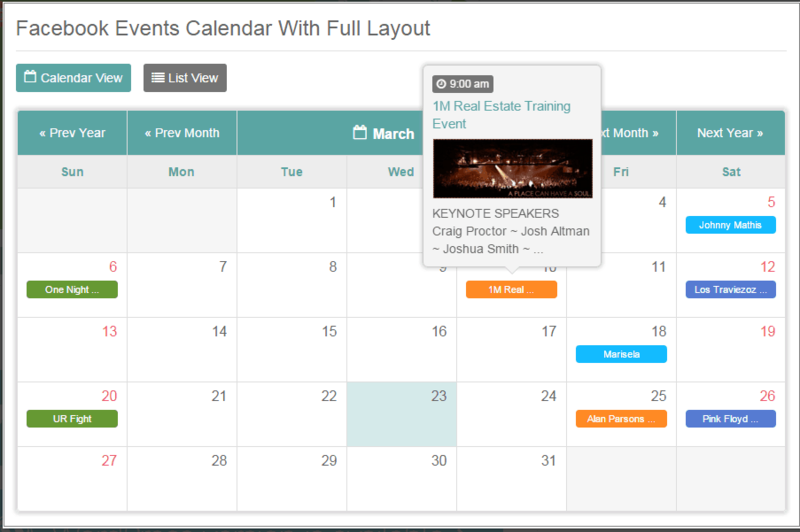 With eCalendar, you can set when, where and why an event is taking place with event title, location, time, and more. Some of its features are responsive design, clean and friendly design, cross-browser compatibility, easy implementation, all events are saved in your MySQL database and it is easy to install from your site’s backend because of its web-based installer. Get all these features for $22 and extend support to 12 months for $6.38. Weekly Time Slot Booking PHP Calendar is a very easy and simple PHP script that can be used for managing and displaying weekly events on any website. This PHP calendar with events lets you organize your weekly events with features like adding, editing, deleting and more from the admin panel. Its pop-up section lets you display the start time for each event with every detail. Other features are the display of events by participants or statistics, locations, and categories, ability to create an unlimited number of events on the calendar, store and search customer/client information with contact info and it also supports multiple languages. This PHP calendar script cost $11 for the regular license with unlimited features. 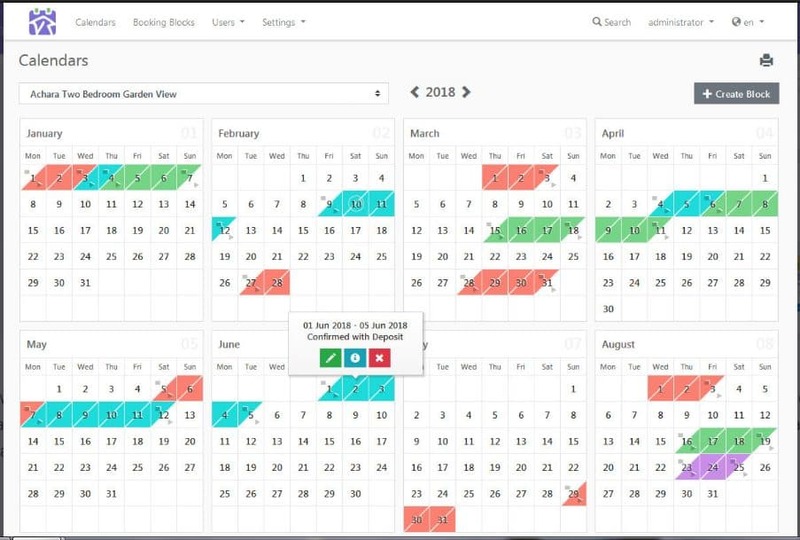 Laravel Booking System with live chat is another PHP calendar with events plugin that can help you with online bookings and appointments. It is a system that enables users to purchase credits as part of its payment options, view total credits available, transactions, and admin contact info from the dashboard. The admin panel lets you manage all your reservations, payment settings, manage users, and general settings. As an admin, you can respond to all inquiries and manage bookings from the dashboard. Enjoy these wonderful features for just $44 and enjoy live chat for support. 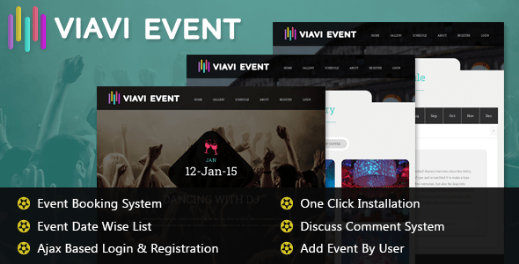 Viavi Event Management System is an advanced PHP script with many features. It is a simple and suitable PHP calendar with events that will serve anybody or businesses in creating and managing events from their sites on the internet. You can add, update and delete events easily without stress all from your dashboard. Creating or adding an event is the simplest thing to do, by setting the event category, event sponsors photo, name, description, start/stop date and many more. Other features that make this PHP script worthy on our list are single and multiple day events, searching events by titles, categorizing events, a responsive layout, users can submit events from the front-end without admin approval, and upcoming events list is displayed by months. Installation is easy and it cost only $27 to enjoy these features. This is an app that allows users to create events with the exact locations on Google Map which they can share on Facebook and other social networks with friends, colleagues, family and much more. You can add an unlimited number of backgrounds from the config file, for your users to use when they also have the need to add their events by choosing a background image. 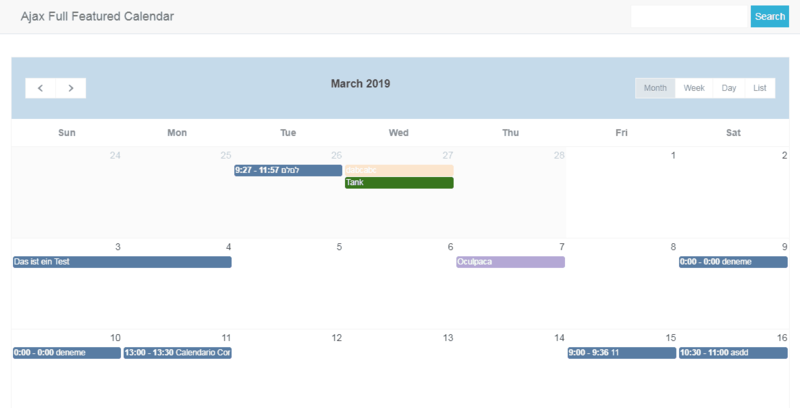 Eventoo PHP Social Events Calendar supports Facebook connection, this enables Facebook users to add events from their Facebook account, this can in-turn generate traffic for your project or website. Every event you post on your public wall has a Facebook like button, Tweet button, and the Facebook comments section for your visitors to interact and share your events. It is responsive and displays well on all devices and costs $17 and an additional $4.50 for 12 months support extension. 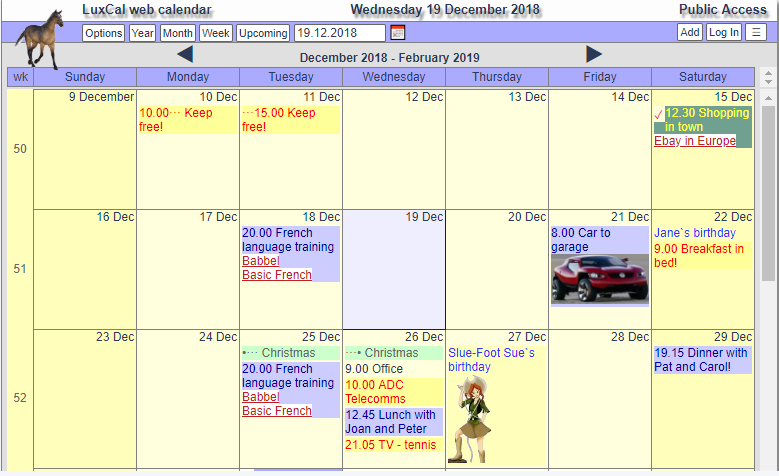 This is yet another PHP Calendar with events from Caledonian. 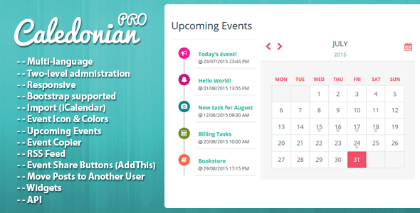 Caledonian Pro is a smooth script with amazing features that will make setting up a calendar and booking system for your business or company website painless and stress-free. It costs $29 to enjoy these amazing features and $9 extra to get 12 months support in case of any challenge you encounter. 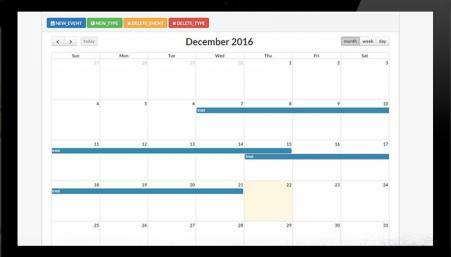 ApPHP Calendar is another PHP Events Calendar Control which will solve your booking and appointment needs online for your clients/customers. This is a strong PHP script that can easily be integrated into many PHP projects like event processors, schedules, bookings and many more. 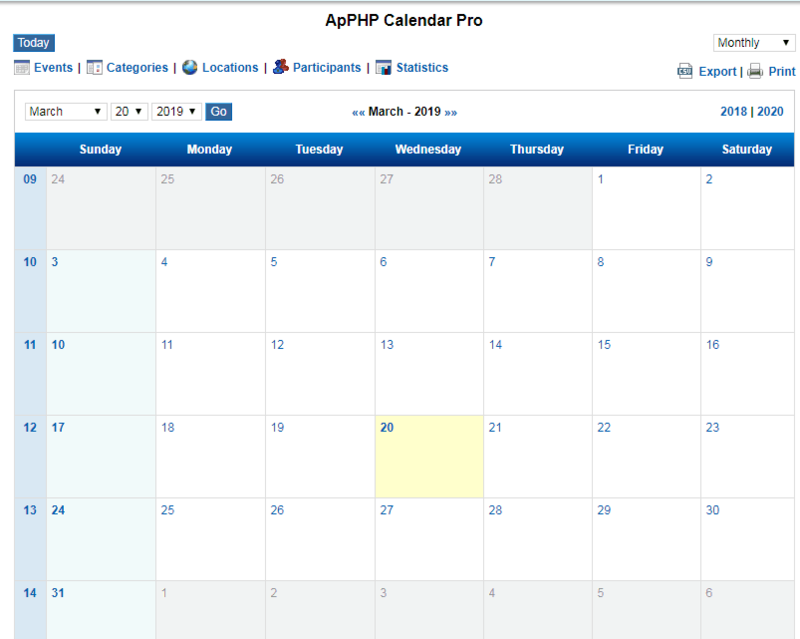 ApPHP Calendar does not require any special skill or knowledge to install and use on your website. Its user-friendly interface makes it easy to navigate with different modes of view for events such as yearly, monthly, weekly, daily and list view. It cost $23 to get this PHP calendar script and its fine features. 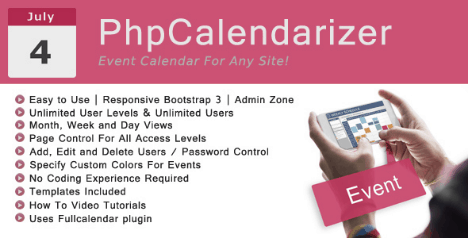 PhpCalendarizer is a lightweight calendar script built to give your website that membership and event management system that is easy to customize and manage. This is a tool that can help you organize and plan your activities or events through its PHP calendar. It can be used for any website or business like schools, galleries, museums, news, musicians, artists, recreation centres, nightclubs and so much more. The regular license costs only $15 with a $3.75 support extension period to 12 months. 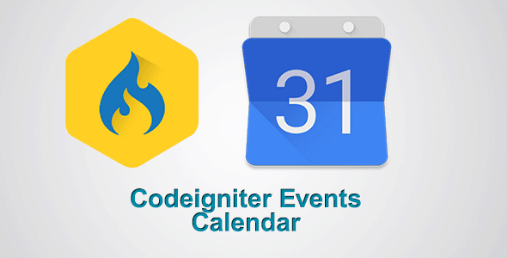 Codeigniter Responsive Events Calendar allows you to add event calendars to any website or project you might be working on which requires a calendar. This event management system also works with any Codeigniter app which will enable it to add, edit, delete and view events. 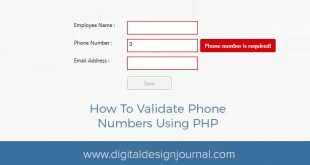 This PHP script reduces the time and effort developers would take to develop a site that requires event calendars. Get the regular license at $13 with the freedom to extend support for $3 only. 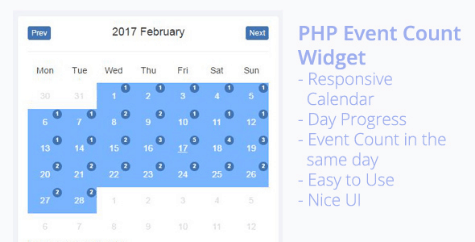 PHP Event Count Widget is a responsive event management calendar which allows you to track daily progress and event count on the same day. It has a nice and user-friendly interface which is very easy to use. It was designed using PHP, jQuery, a responsive calendar and bootstrap which makes it smooth and clean to use on all websites. It will cost you $14 to enjoy its features and an additional $338 for support extension up to 12 months. 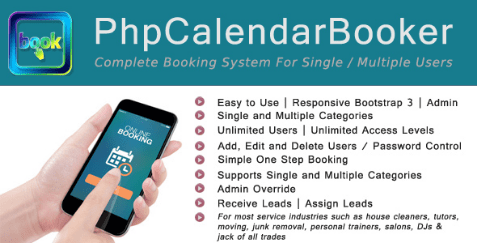 This nice PhpCalendarBooker is a complete booking system that can serve both single and multiple users. It is easy to use by unlimited users and unlimited access. It is designed with back-end admin, who can allow/override, assign jobs to himself or members, change dates, add categories, set color schemes, control to ban/delete members, edit categories, display calendar to the public, allow users to signup, set hours of operation, and many more. To get this script, you have to pay $25 with a support extension of $7.50. This PHP script is specifically useful for those in hotel management, real estate management, rental homes, vacation homes, guest house or room rent and so on. 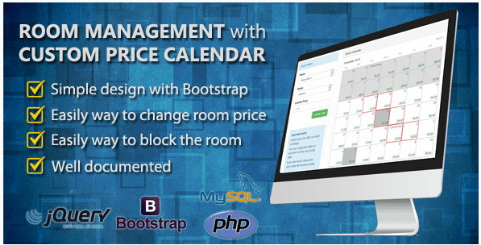 Room Management with custom price calendar is designed using jQuery, Bootstrap, MySQL, and PHP. It is a simple way for users to customize room prices say for weekends, holidays, and other discounts available. Users can add, edit, and delete rooms as well as change room status from available to unavailable. It goes for $15 and an additional $3.75 for support extension. This is one of the simplest and most user-friendly application to use for your events. 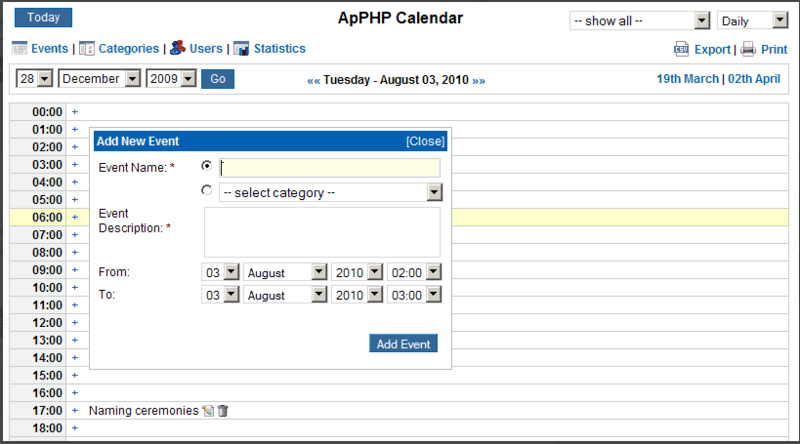 Event List PHP Calendar has a secure admin panel where users can add, and edit events without hassles. It comes integrated with Google Map to show more specifically where an event will take place. Users can change the theme colours from blue, green and red depending on your preference. This tool makes event management easy and a piece of cake. This tool goes for just $9 without any support. There you have it, the top 40 PHP Calendar with events and these are the best PHP calendar scripts in 2018. So, if you are looking for the perfect tool to create and add appointment bookings, scheduling, events, quizzes, reservations and much more on your private or business site, then you have it all. This PHP calendar with events will help you connect with your customers/clients conveniently by ensuring a flexible time, date, place and location. Our aim is to see that you make good use of these PHP scripts thereby enhancing your website and online presence in a comfortable manner. We hope that you will enjoy using these amazing tools to boost your business/company. You can share your thoughts with us about your experience after using these tools via our comment section.